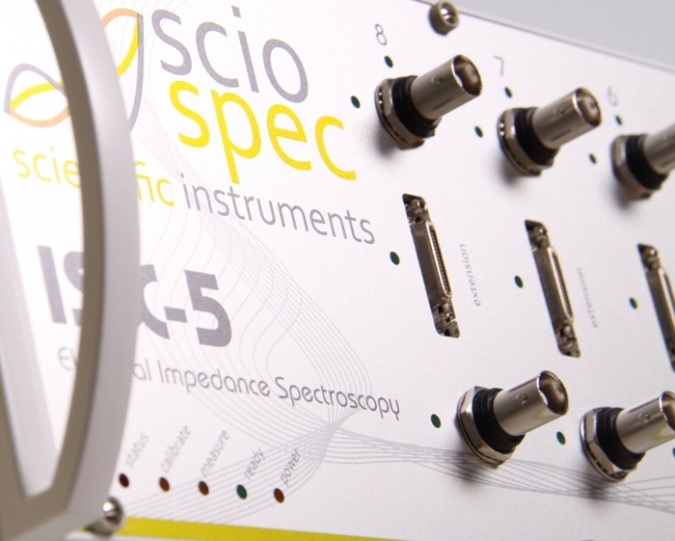 Sciospec specializes in solutions for electrical impedance spectroscopy and other electrochemical techniques. Additionally a growing range of optical and laser based methods is supported. Apart from our range of standard laboratory products, the highly modular platform enables cost efficient, yet highly precise application specific solutions for research and industrial use. Primary applications are bio-analytics, material science, biosensors and process control. 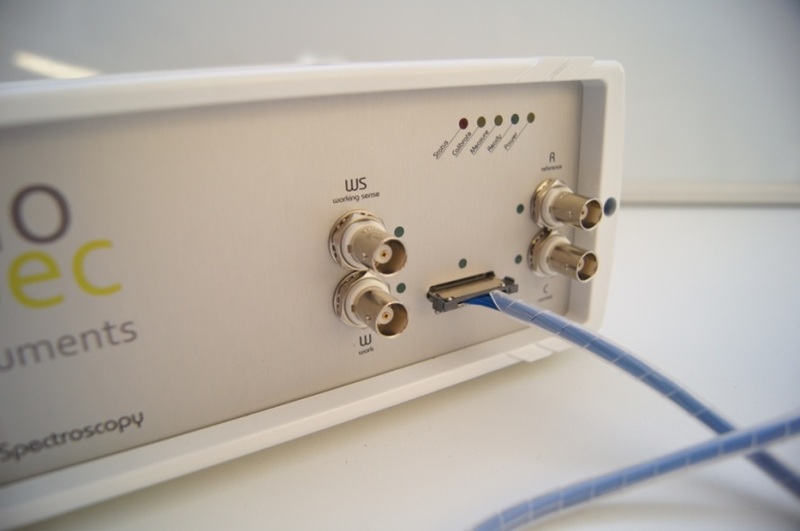 Impedance spectroscopy, massive multichannel DAQ, potentio-galvonstats, QCM, temperature control, optical and laser based methods are available as OEM or integrated into lab instruments. You want to use impedance spectroscopy and not spend a fortune? You like it simple, but still need precision and speed? 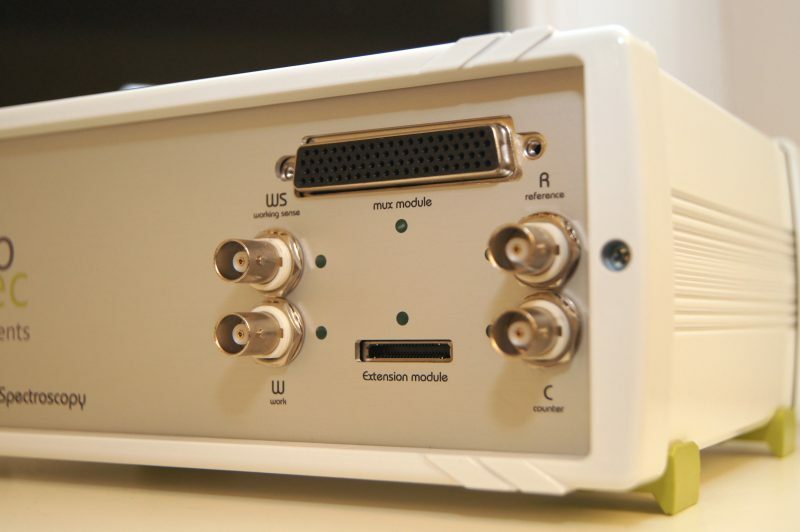 The compact ISX-3 impedance analyzer is your solution. 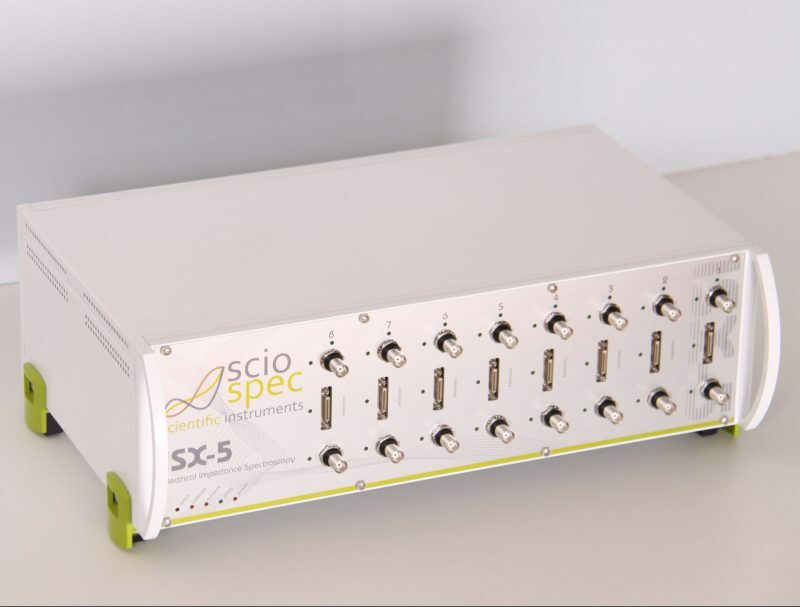 In standard configuration the ISX-3 is equipped with Sciospec’s IF frontend with 4-port BNC interface supporting simple 2 point measurements, as well as 3 and 4 electrode configurations. Within the measurement range from DC to 10MHz covers a dynamic range of 180dB (Ohm…GOhm) a base precision better than 0.1% is achieved. 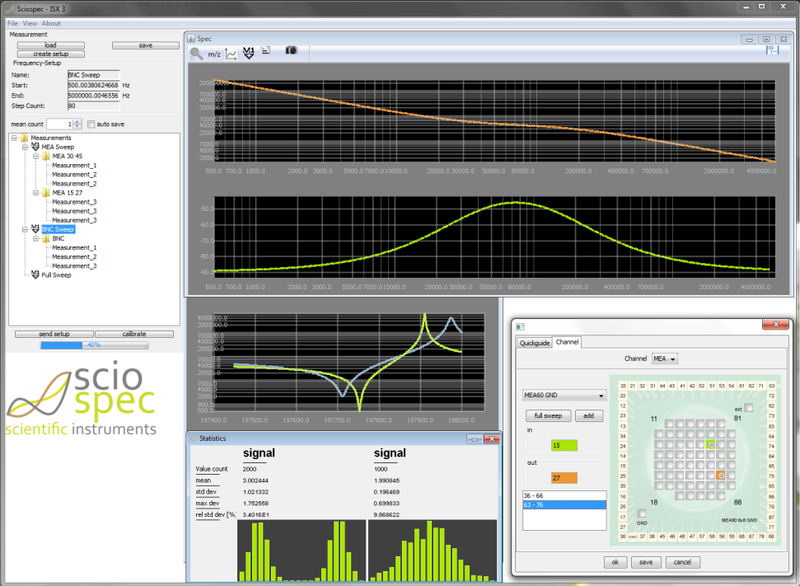 Sciospec Com-Interface for full instrument control from Java, C, LabView, Matlab etc. 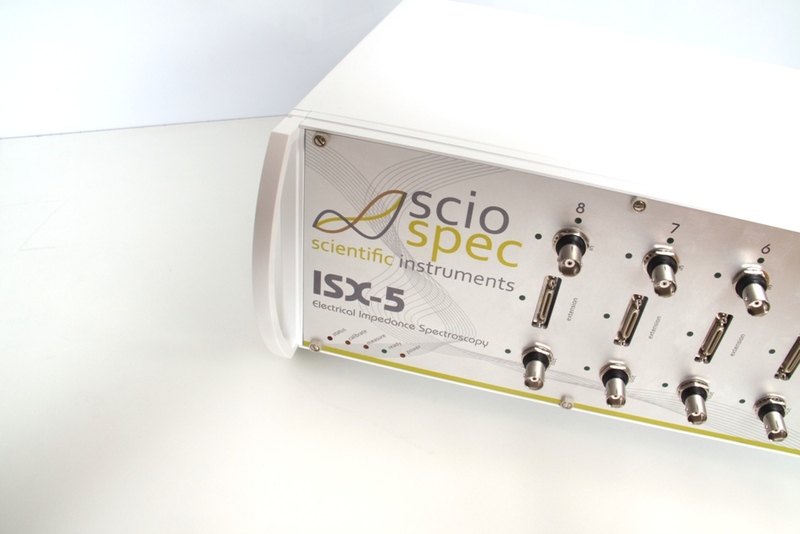 As one of Sciospec’s first products the ISX-3 has long proven its worth in everyday use. Today it is put to use in leading research institutes across Europe paving the way for new applications of impedance spectroscopy thanks to its outstanding performance and unbeatable cost efficiency. The ISX-3 is controlled via High Speed USB or Ethernet. Optionally wireless LAN is available. The ISX-3 comes with Sciospec’s PC-based software for graphical configuration and data analysis. 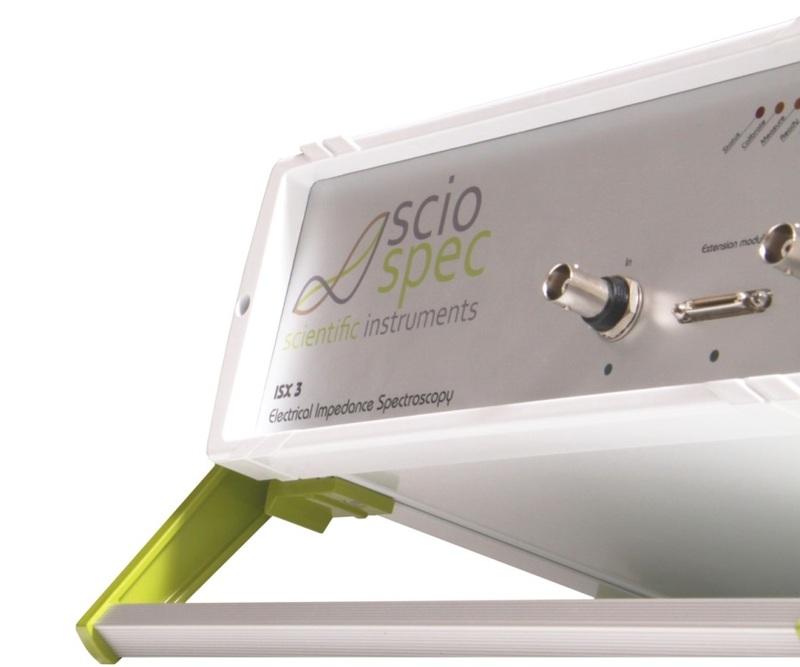 Additionally the system can be completely controlled the Sciospec Com-Interface. Custom code in Java and C are just as possible as the integration in LabView or Matlab. 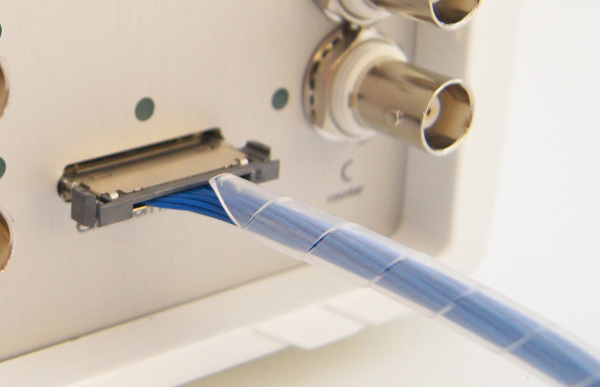 For synchronization with other devices and integration into more complex laboratory setups ultra fast and highly flexible programmable hardware synchronization through sync in/out connectors (digital) is available in every ISX-3. For simple lab automation and control/read out of additional hardware or sensors the ISX-3 can optionally be equipped with the IOport. This is a D-Sub-Mikro-D Verbinder with 8 digital IOs and 2 temperature sensor connections. As with the the ExtensionPort the digital IOs can also be configured as serial interfaces (I2C, UART). 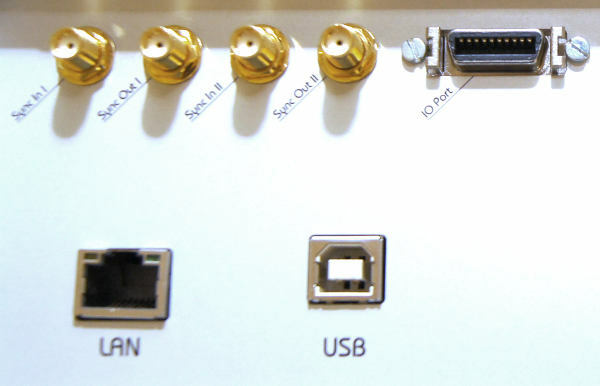 For flexible extension of its application possibilities application specific frontends and adapters can be connected through theExtensionPort system. Interface and specifications for theExtensionPort are fully user accessible dramatically simplifying customer`s developments for and with the ISX-3. The connector carries measurement signals for 2,3 and 4-electrode configuration, supply rails and digital IOs, which can optionally be configured as serial interfaces (I2C, UART). Demanding measurements but no room for large and bulky lab equipment? Impedance Spectroscopy out in the field? 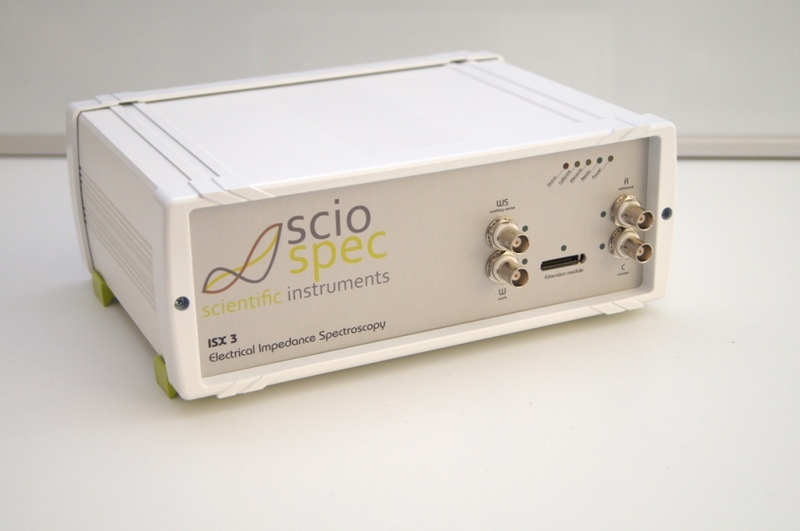 With the ISX-3mini Sciospec offers a fully equipped impedance analyzer fitting in the palm of your hand. In standard configuration the ISX-3 is equipped with Sciospec’s IF frontend. Within the measurement range from DC to 10MHz covers a dynamic range of 180dB (Ohm…GOhm) a base precision better than 0.1% is achieved. The two multiplexed 4-electrode MCX measurement ports greatly simplify comparative measurements of two sensors or devices under test. The ISX-3mini puts the full power of a laboratory grade impedance analyzer in the palm of your hand. The ISX-3mini is controlled via High Speed USB or Ethernet. Optionally wireless LAN is available. The ISX-3mini comes with Sciospec’s PC-based software for graphical configuration and data analysis. 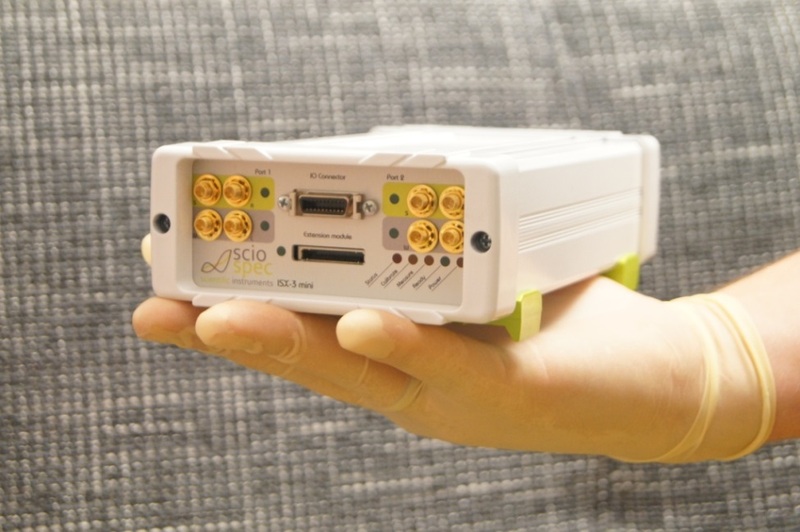 Additionally the system can be completely controlled the Sciospec Com-Interface. Custom code in Java and C are just as possible as the integration in LabView or Matlab. For synchronization with other devices and integration into more complex laboratory setups ultra fast and highly flexible programmable hardware synchronization through sync in/out connectors (digital) is available in every ISX-3mini. For simple lab automation and control/read out of additional hardware or sensors the ISX-3mini is equipped with the IOport. This is a D-Sub-Mikro-D Verbinder with 8 digital IOs and 2 temperature sensor connections. As with the the ExtensionPort the digital IOs can also be configured as serial interfaces (I2C, UART). For flexible extension of its application possibilities application specific frontends and adapters can be connected through theExtensionPort system. 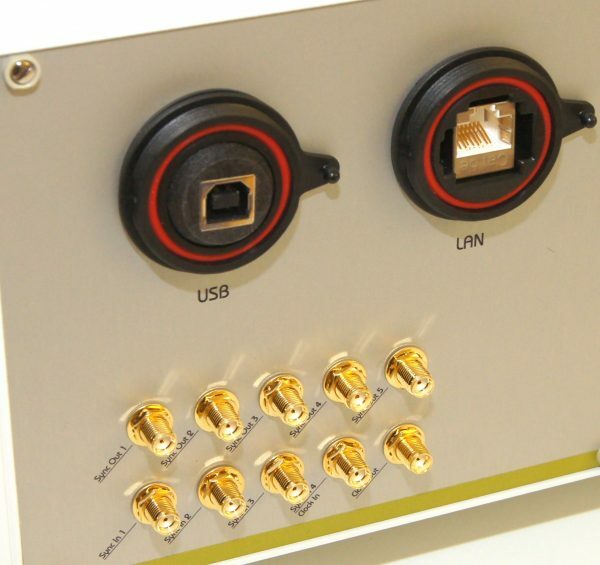 Interface and specifications for theExtensionPort are fully user accessible dramatically simplifying customer`s developments for and with the ISX-3mini. The connector carries measurement signals for 2,3 and 4-electrode configuration, supply rails and digital IOs, which can optionally be configured as serial interfaces (I2C, UART). Your plans are a little bigger, than what a single impedance analyzer can handle? How about having multiple full featured impedance analyzers within one instrument - working in perfect harmony? Up to eight impedance measurement channels can be integrated into one ISX-5 and provide true fully-parallel ultra-fast measurements thanks to the powerful signal processing backend. Multiple ISX-5 chassis can be joined together to enable even higher channel counts. For even more flexibility and more demanding complex measurement setups check out the MSX modular platform - the multi type module extension of the ISX-5. More performance, higher throughput, more channels - the ISX-5 system is the solution for everyone who wants to raise the bar a little higher.